Don't underestimate Charlie Appleby - that's the message from jockey Kerrin McEvoy following his first look at Sydney Cup favourite Dubhe at Canterbury on Wednesday. While the market certainly highly respects the four-year-old - $3 favourite with TAB - the fact remains he's only had seven starts and heads into the Group 1 $2m Schweppes Sydney Cup (3200m) having never contested a group race. But McEvoy reminds us we've been there before with an Appleby stayer and only need to look back to November for an example of his expertise. "You could have said the same thing about Cross Counter,'' McEvoy said. 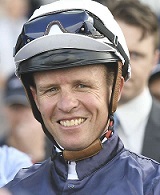 "Even though these stayers are lightly raced they ride like they've had 30 or 40 starts. An old head on young shoulders and that's what I said about Cross Counter. Dubhe picked up his third race when scoring over 3200m at Meydan in Dubai on February 7. He wasn't out to break any records in his work on Wednesday, it was basically three-quarter work and a chance for McEvoy to familiarise himself. For the record he covered his last 600m in 43.7 and the work was enough for McEvoy to think he can provide Appleby with his third major two mile success in Australia. Of course Cross Counter won the Melbourne Cup in the spring and Appleby took out the 2017 Sydney Cup with Polarisation. "He seems to have settled in well here, Charlie said he's very laid back in his work in the mornings and that's how he felt,'' he said. "He went around in cruise mode but he feels well, looks bright and healthy in the coat and stretched out nicely up the running for me once he warmed up. "Charlie has pinpointed what's required in travelling horses and in relation to which horses to bring out and that gives you confidence. Queen Elizabeth Stakes second favourite He's Eminent worked a shade more seriously with race jockey James McDonald in the saddle on Wednesday morning. He finished his gallop with a last 600m of 38.97 and was under a decent hold. "He is working with great purpose and that's evident in the way he is finishing off as well. He's getting harder and harder to pull up,'' McDonald said. We all know how difficult it is going to be to even threaten Winx in the Group 1 $4m Longines Queen Elizabeth Stakes (2000m). McDonald, who rode Winx to win number three of the 32 win streak, said he wouldn't feel bad if he caused the unthinkable but it's no easy job. "Like every other I've had four years of seeing her backside, we haven't overcome that hurdle yet,'' he said. Most expect McDonald to repeat his Ranvet ride on He's Eminent and try to open up a decent break between him and Winx but he's playing his cards close on that front. He said the five-year-old will definitely be in the first four and he will look to make use of the sustained speed he's capable of on better ground. As for He’s Eminent’s future, trainer Sir Mark Todd said he’ll head to Hong Kong and then back to the UK where he could show up at Royal Ascot.